The leadership of the Orange Order has rejected a call from Sinn Fein President Gerry Adams for talks between the two organisations following three days of parade-fuelled riots in Belfast. Heavy rioting continued up to Wednesday night in Ardoyne, with disturbances also reported at other interfaces in Belfast, namely the Short Strand, Ligoniel and on the Springfield Road. The Orange Order, named after King William of Orange and dedicated to advancing the cause of Protestantism, has long refused to reroute parades away from those nationalist and largely Catholic areas where residents oppose them. Marching in Orange sashes, carrying umbrellas and wearing bowler hats to mimic the fashion of London businessmen, a number of their parades still wend their way into the most deprived Catholic communities in a primitive show of strength by the Orangemen and their loyalist supporters. Resistance to these overtly sectarian parades increased throughout the 1990’s but faded following the 1998 Good Friday Agreement. As Sinn Fein sought to bed down the peace process, it began the practice of facilitating and marshalling the order’s parades through its strongholds. However, disaffection with Sinn Fein in nationalist areas has seen a resurgence in opposition to the parades and has fuelled antagonism between Sinn Fein loyalists and so-called “dissidents”. While republicans were divided on their response to the rioting, they were united in calls for the Orange Order to find a new approach and, in particular, reroute its parades away from those locations where they are opposed by residents. Gerry Adams said this week that Orangeism had a part to play in his vision of a united Ireland, but that the “six or seven parades” which remain a source of conflict could only be resolved through dialogue. “They (the Order) talk about being a Christian organisation, about neighbourliness, and I don’t dissent from any of that and I don’t say any of this to undermine the good decent people who were involved in the Orange, but why on earth can’t they come forward and meet us?” he said. However, the Grand Secretary of the Orange Order Drew Nelson claimed Sinn Fein did not respect “Orange culture”. “It’s time nationalists and republicans showed respect and tolerance for Orange Order and allowed them to get on with celebrating their culture,” he said. He insisted that there was no prospect of a meeting until Sinn Fein apologised for the armed struggle and the deaths of Orangemen in the conflict. Sinn Fein was “still attempting to justify and glorify the IRA’s campaign of violence”, he said. Mr Adams described the Order’s response as “disappointing”. He pointed out that while his opinion on the IRA may be different from the Order’s, he had already publicly stated his regret over the deaths inflicted and had never glorified the IRA’s actions. “For the record I have never glorified IRA killings. My position on the IRA is a matter of public record. Mr Nelson disagrees with me. He, like me, is entitled to his opinion. Meanwhile, Eirigi accused the Orange Order of being solely interested in supremacism. The new republican political party said that Ardoyne residents were routinely being subjected to sectarian intimidation by loyalist parades. “As the Orange Order passed Ardoyne, 300 drunken unionists gathered opposite in Twaddell Avenue to dance and sing sectarian party songs,” a spokesman said. “Dignified nationalist residents, meanwhile, were corralled and forced back into their own area by the PSNI. The violent response of nationalist youths to the situation was “as predictable as it was undesirable”, Eirigi said. “The Orange Order is well aware that north Belfast is a tinderbox, made so by years of discrimination, poverty, oppression and sectarianism. “Eighty per cent of those on the social housing waiting list in north Belfast are from nationalist communities. 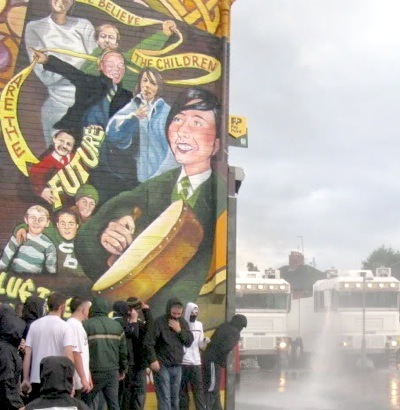 It is only nine years since one of most the blatantly sectarian campaigns in the history of the Six County state was launched when baying mobs attempted to prevent the children of Ardoyne from entering Holy Cross Primary School. It pointed out that nationalists remain two and a half times more likely to be unemployed than unionists.